Enjoy a grand share of free spins and multipliers on 300 Shields slots! Take your army and battle against your enemies to earn huge payouts! Engross yourself into a blood spilled slot game right here at Moon Games! 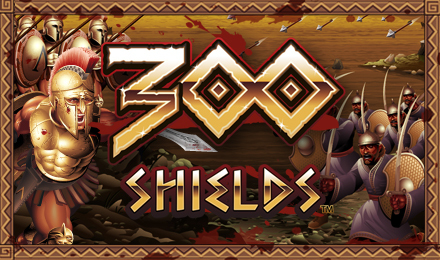 300 Shields is a 5 reel and 25 payline slot game that is packed with multipliers, bonus rounds, and the main feature Battle Feature Free Games bonus round! This feature can be triggered by landing three or more shield symbols. Be awarded 5 free spins and a 2x multiplier. On the features, increase your warrior wins multiplier to 300x! By collecting more shields, you can get a second series of 5 spins and higher multipliers!